Arizona to Texas Freight shipping and trucking services are in high demand; the route from Dallas to Phoenix is primarily a very busy lane. 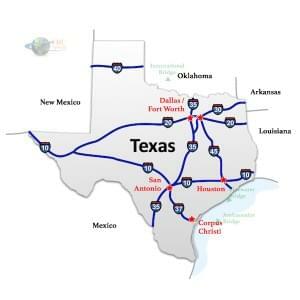 The Phoenix, AZ to Dallas, TX route is a 1064 mile haul that takes more than 14 hours of driving to complete. Shipping from Arizona to Texas ranges from a minimum of 200 miles and 2 1/2 hours from San Simon, Arizona to El Paso, Texas and over 1500 miles and a minimum of 22 hours on the road from the Northwest Tip of Arizona bordering Las Vegas, NV to the south point of Texas in Brownsville, TX. The shortest route from Arizona to Texas is along the I-10 corridor; however, there’s also a more northerly route that uses the I-40, passing through Albuquerque, NM rather than Las Cruces, NM.